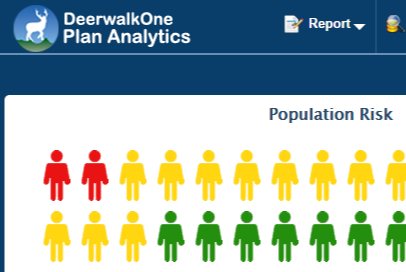 What is Deerwalk Plan Analytics? Deerwalk Plan Analytics is a software solution that provides integrated informatics and actionable insights and savings recommendations, presented in an easy-to-use application that requires no special training. By housing current and historical data, the Plan Analytics supports period-to-period comparisons and trending analysis. use Plan Analytics to help employers manage their health plans. TPAs can create a custom report package for each employer client they serve and can generate ad-hoc reports without dedicating resources to build custom queries. To run any report they desire they simply create a cohort and click a button. The report is generated within minutes, or even seconds. use the Plan Analytics product’s 360-degree view of patient, clinical risk indicators and care gap alerts to identify opportunities for interventions. The product allows them to report effectiveness of clinical programs and determine ROI. Plan Analytics provides an easy way to report on cost and utilization for the clients they serve. (MCOs), physician groups, Accountable Care Organizations (ACOs) and other stakeholders in the healthcare supply chain use Deerwalk Plan Analytics to optimize care. They can manage population health and measure physician performance, all from a single platform. and their advisors use Plan Analytics because it’s a simple way to integrate, access and organize information about the effectiveness of health management programs. Users can assess the effectiveness of care management interventions. They can identify compliance with evidence-based care standards and compare the utilization and financial results of people participating in health management programs with those who are not. many clients use Plan Analytics as a data warehouse. They store and manage all types of data including benefits information such as payroll, workers’ compensation, and 401k information; consumer data, like medical and pharmacy claims; and clinical data, including lab and Health Risk Assessment (HRA) results. Deerwalk integrates virtually any data generated in the healthcare ecosystem. Users easily access information searching by any combination of parameters, instantaneously. With Deerwalk, there is no need to wait for custom reports to be pre-programmed. Only one company provides an integrated suite of health analytics solutions on a single platform. Only one puts Big Data to work for you. Only one transforms the experience.